Just a stroll over the Brooklyn Bridge or one train stop from Manhattan, DUMBO (short for Down Under the Manhattan Bridge Overpass) is one of Brooklyn's trendiest neighborhoods. 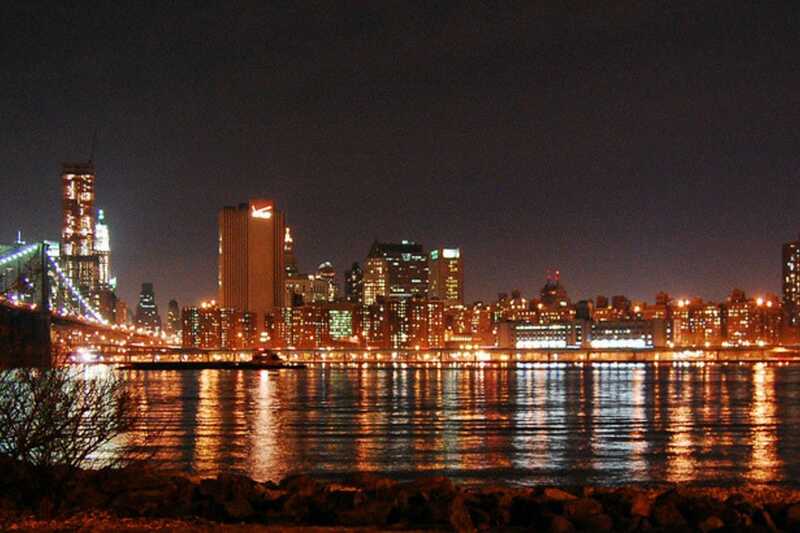 It is full of restaurants, art galleries and bars, but its most alluring feature is the views of the Manhattan skyline and two of NYC's bridges from waterfront Brooklyn Bridge Park. Brooklyn Bridge Park, comprised of 1.3 miles of prime waterfront piers, promenades and viewpoints, looks across the East River into stunning Manhattan. Check out the volley ball courts, grab a beer at one of the concession stands or pack a picnic to enjoy under the rosebushes on one of the many lawns. Grimaldi's is New York's oldest and most famous pizza parlor. The DUMBO location (next door to the original and just a block from the East River Waterfront and Brooklyn Bridge Park), serves up mouthwatering and piping hot neapolitan style pies from a coal fired oven. Be careful, during peak hours expect to wait. This cute and upscale bar in DUMBO is unpretentious and arty, perfect for Friday night cocktails after a day of strolling in Brooklyn Bridge Park and an evening of taking in the newest Brooklyn artist's work at the DAC and local galleries. Stop into 68 Jay St. Bar for happy hour deals and hob nob with the art scenes coolest contributors. This downtown Brooklyn hotel features views of the Brooklyn Bridge, Brooklyn waterfront and Manhattan skyline. Conveniently located and luxurious, featuring amenities like lap pool, wifi, Archive Restaurant and valet parking, The Marriott New York at the Brooklyn Bridge is a great place to launch your explorations of the Big Apple. The crucial heart of the ever-cool Brooklyn art scene, DAC is not to be missed. Admission is free to DAC and numerous DUMBO galleries during neighborhood art walks. Shop for cool post modern art pieces or just sip wine, browse and treat your senses to an always stimulating mix of sculptures, live music, performance art and paintings.